Philadelphia Police continue to be on alert after receiving a tip following last week's ambush shooting of Officer Jesse Hartnett. On Saturday night, police received an anonymous tip that 30-year-old Edward Archer belonged to a group of radicalized men that may still be targeting law enforcement. A woman approached a police officer in Center City and told him that Archer is one of a group of four and that he is not the most radical. She said the “threat is not over” and that these men "frequent the 6100 block of Pine and for the police to be careful." The FBI continue to investigate. 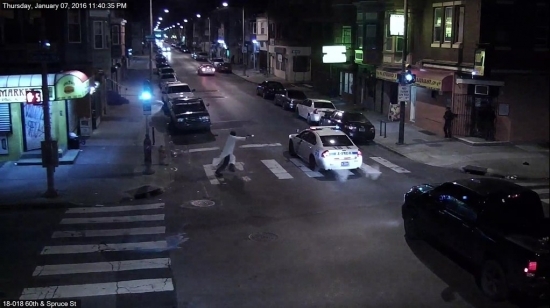 Last night a Philadelphia Police Officer was stopped by a citizen on the street who proceeded to make statements regarding the defendant involved in the shooting ambush on Officer Hartnett, which occurred on January 7, 2016. The citizen alleged the defendant had an affiliation to a group with radical beliefs. The Philadelphia Police Department and Federal Partners take this type of information very seriously, particularly after the recent attack on Officer Hartnett. Therefore, the department along with the Federal Bureau of Investigation is actively investigating these allegations in an effort to verify the credibility of the information given. The Philadelphia Police Department has alerted all department personnel of this matter and will continue to have officers work with a partner until further notice. As always, we encourage any information or tips from members of the community regarding this matter. A 7-month-old baby girl has died, days after her mother allegedly rolled over on top of her while under the influence of drugs. The baby's father, Marco Mejia, said that Olaia Marie Mejia passed away on Friday morning at St. Christopher’s Hospital in Philadelphia. The Atlantic County Prosecutor's Office says the baby was discovered unresponsive and unconscious on January 3rd in her home on the 5700 block of Monmouth Avenue in Ventnor, New Jersey. CPR was performed by medical personnel before Olaia was taken to the hospital. Her mother, Lisa Scalia, was charged with Endangering the Welfare of a Child and four counts of Possession of Controlled dangerous Substances. Police discovered 34 bags of heroin and 10 oxycodone pills. She is being held on $100,000 cash bail. More charges could be filed now that her daughter has died.